Our well trained and licenced staff will do a thorough inspection of your home and property and diagnose the problem. After removing the unwanted pests from your home or business, we will seal any openings the dangerous pests may have found to enter your structure. Deliver one of the more painful insect stings, like other yellow jackets, which can cause swelling, become infected easily and aggravate skin conditions or allergies. Guards positioned at the nest’s opening will aggressively defend the nest when disturbed. 5/8 to 3/4 inch long; bluish-black with white markings. Paper nests made from wood (from logs, bark, decks and houses) in tree limbs, hollow trees, large shrubs, bushes or on the sides of homes and buildings. May occasionally build nests in wall voids and house attics. 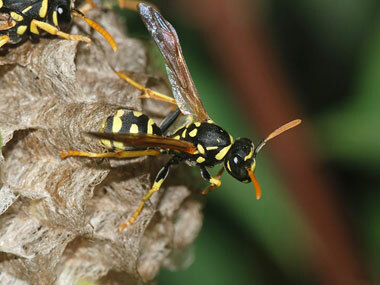 Loud vibrating noises, such as those from lawnmowers and leaf blowers, can irritate and threaten hornet workers, causing them to sting people and animals. Nests can become larger than a basketball and contain hundreds of hornets. 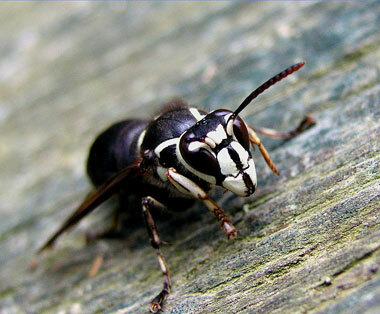 Unlike a bee, bald-faced hornets can sting repeatedly. Bites can leave itchy, bloody welts on the skin and can cause allergic reactions, such as severe itching. Flat, reddish-brown, oval insects about 3/16 inch long or the size of an apple seed. Swollen and reddish after a blood meal. Large infestations can be detected by a sweet smell like that of soda-pop syrup. Cracks and crevices including mattress seams, sheets, furniture, behind baseboards, electrical outlet plates and picture frames. 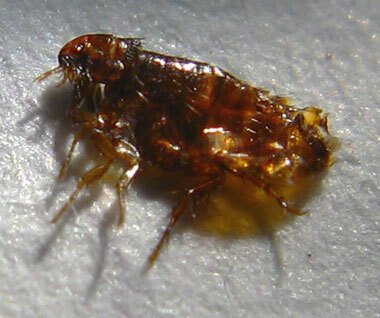 Often found in hotels, where they can travel from room to room and in visitors’ luggage. 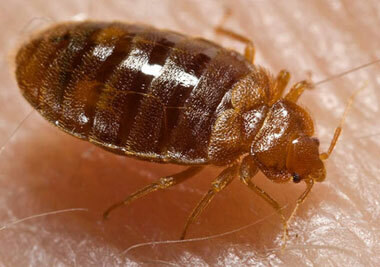 Bed bugs were once thought to be eradicated in the United States but are making a comeback. Bed bugs are difficult to control, as they can live for more than a year without eating. Although the species that transmit diseases are extremely rare in the United States, in Central and South America and particularly in Africa, black flies transmit onchocerciasis, a disease that causes blindness if untreated. 1/32 to 1/4 inch in length; with humped-back appearance; typically black, but sometimes gray or red. In or near shallow waters of rapidly moving rivers or streams. Throughout North America. However, the species that transmit diseases to humans are found mostly in Africa, Central and South America. 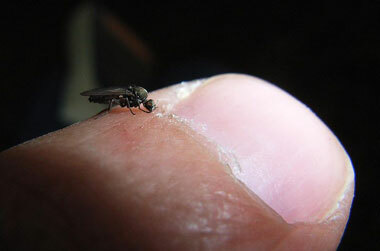 Black flies typically feed in the evening, early morning or in shady areas during the day. They are attracted to dark clothing and have been known to fly up to 93 miles from their breeding site to feed on people or other warm-blooded animals. Inflict a painful, though rarely fatal, bite. The venom from their bite can increase a victim’s body temperature and blood pressure, causing sweating and nausea. Approximately 1/2 inch long or the size of a dime; jet black and shiny. Some adult females have red markings often forming an hour-glass shape on the abdomen. Construct randomly-shaped webs in secluded, undisturbed areas. Can be found indoors and outdoors. Webs are typically built near the ground in dark areas, such as in firewood piles or between boxes. Throughout the United States, southern Canada and Mexico. 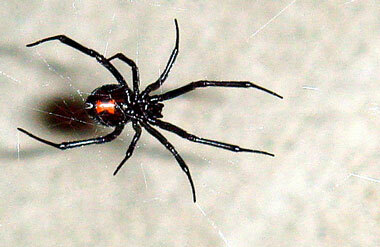 Black widows can hide in dark areas, so use caution when moving stored items. Using gloves, remove piles of lumber and other debris and stack firewood as far away from the home as possible. Bites over time can become intensely painful, cause fever, insomnia and deep, slowhealing open wounds. If untreated, bites can become infected, causing skin tissue to die. Young children and the elderly are especially susceptible. Adults range from approximately 1/4 to 1/2 inch long. Yellowish-brown with a darkbrown, violin shaped marking. Have long, thin legs with fine hair instead of spines. Have six eyes rather than typical eight for a spider. Found outdoors in debris, wood piles and under logs and stones. Found hiding indoors in storage areas such as attics and crawl spaces, clothing, boxes and furniture. Found in several parts of the United States from central states southward to the Gulf of Mexico. Also found in Mexico and Central America. 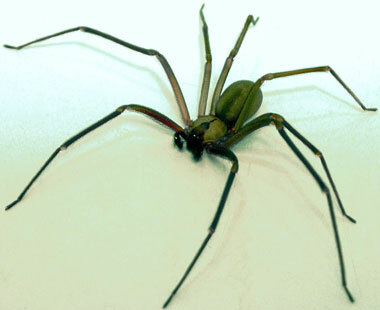 Brown recluse spiders are nocturnal and like to hide in shoes and clothing. Shake clothing and shoes before wear. Can transmit Trypanosoma cruzi, the parasite that causes Chagas disease, a serious disease found mostly in South and Central America. Chagas disease has been found in North America, though cases are rare. Bug bites are usually painless, but can trigger allergic reactions in sensitive persons. 1/2 to 1 inch long; black or dark brown; large eyes, elongated head and neck. Wings form a distinctive “X” when folded. Live and deposit their eggs in the cracks and crevices of homes, buildings and other manmade structures. They hide during the day and come out at night to feed on sleeping hosts including people, rats, raccoons, cats and dogs. Kissing bugs have been found between the bed frame and box springs or mattress. Found in the United States from Maryland down to Florida and west to California. Also found in Mexico and Central America. Preventive measures include insecticide spraying of infested houses and the use of bed netting for travelers who cannot avoid camping or sleeping outdoors. Known as kissing bugs because they occasionally bite their hosts on the face, near the lips. There is no vaccine for Chagas disease. Inflict painful bites, which can, in rare cases, cause tularemia, a disease typically found in animals, especially rodents, rabbits and hares. About 200 human cases of tularemia are reported each year in the United States. Possible symptoms include skin ulcers, swollen and painful lymph glands, inflamed eyes, sore throat, mouth sores, diarrhea or pneumonia, depending on the route of infection. Approximately 1/2 inch long, black or brownish in color with yellow or greenish markings. 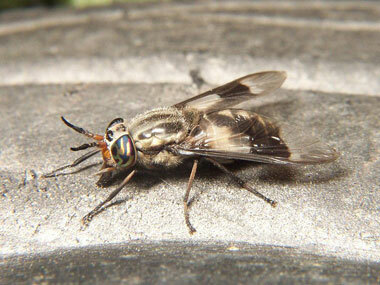 Often mistaken for a horse fly, but distinguishable by dark markings on their wings. Usually found outdoors in rural areas. Male deer flies feed mostly on pollen and plant juices. Only females are blood sucking. Rasping, sucking mouthparts run up and down their victims in a razor-like motion to increase blood flow. 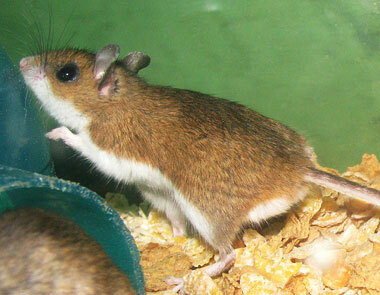 Deer mice transmit hantaviruses, which may cause hantavirus pulmonary syndrome (HPS). Hantaviruses cause flu-like symptoms, and over one-third of the cases lead to death. Currently there is no treatment or vaccine for HPS. 4 3/4 to 9 inches long including tail. Small, white-footed, tan or brown on top and white on the bottom. Variety of habitats, from grasslands to brushy areas to deserts. May also be found in and around homes. Throughout most of North America, except for the southeast and eastern seaboard. Rodent control remains the primary strategy for preventing hantavirus infection. Seal up rodent entry holes or gaps. Trap rats and mice by using an appropriate snap trap. Clean up rodent food sources and nesting sites and take precautions when cleaning rodent-infested areas. Live mice that are trapped and released will likely return to the home. Deer mice have been shown to return to a home from as far as one mile away. Bites cause irritation, blood loss and itching. Some species can spread diseases such as bubonic plague and murine typhus. Other species of fleas can be intermediate carriers of tapeworms and can infect humans if accidentally ingested. Miniscule, wingless parasites about 1/8 inch long or about the size of a poppy seed. Covered in spines with piercing mouthparts. Extremely difficult to crush. Live and breed on host animal’s body; often found near pet bedding; attracted to hair and fur. Often found on varmints such as rodents (including Norway or roof rats), raccoons and opossums. Of the approximately 2,500 species of fleas that infest birds and mammals throughout the world, people typically encounter only a few species, including the cat flea, dog flea, human flea, poultry sticktight flea and the oriental rat flea. Can jump 6 to 8 inches vertically, and 14 to 16 inches horizontally. Historically significant in that they carried and transmitted the bubonic plague (largest epidemic before AIDS), which killed a quarter of the world’s population in the 14th century. Bites can cause flesh to rot, resulting in disfiguring scars, and headaches that last as long as seven days. 7/16 to 5/8 inch long. Has a herringbone stripe pattern of brown, gray and tan on the abdomen with hairy legs. Found mostly outside, but are found inside within wall voids and other places where there is not much activity. They are also found in bath areas because of the moisture. Primarily found in the Pacific Northwest of the United States but expanding territory. 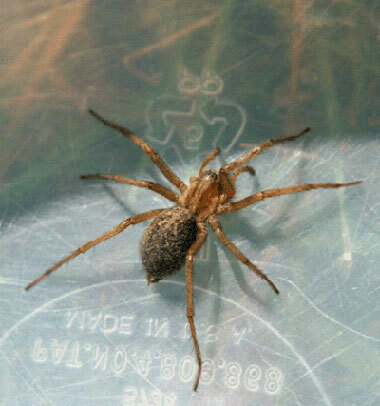 Keeping trash and rubble to a minimum and sealing windows and doors can help prevent hobo spiders. Inflict potent stings that if repeated can result in hypersensitivity in two percent of the population. Up to 5/8 inch long. Covered with short, dense golden brown and black hair; striped abdomen. Around flowers and flowering trees. Can also make a hive inside a building or wall void. Important in agriculture to pollinate crops. Throughout North America, consisting of a number of races or subspecies. Today, they are naturalized on every continent except Antarctica. Wear proper clothing and use caution when honey bees are foraging around your home on flowering trees and plants. Honey bees are social insects, and they can only survive as a member of a community with a queen, drones and workers. A queen can lay 1,500 to 2,000 eggs in a single day. 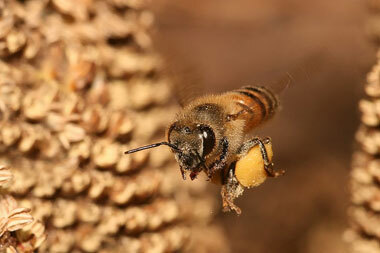 Honey bees play an important role in agriculture for the pollination of more than 100 crops in the United States. Inflict painful bites with rasping, sucking mouthparts that can result in visible, bleeding wounds. Usually up to 3/4 inch or larger. 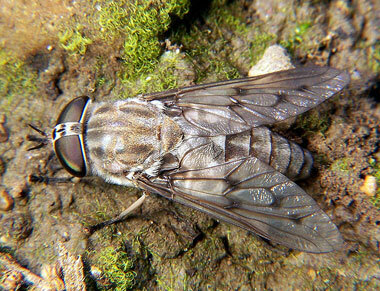 Often mistaken for the smaller deer fly. Typically found near domestic and wild animals; breed in damp areas in woodlands or forest areas. 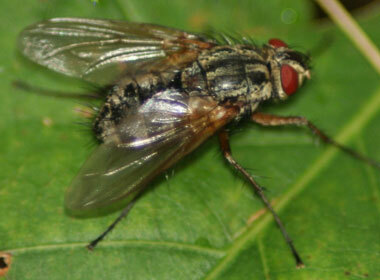 Although a rare occurrence, horse flies can be attracted indoors by dark shadows created by open doorways, such as garage doors, covered decks or open windows. In the Old West, these flies were sometimes responsible for causing stampedes by biting horses repeatedly. Some species of centipede, including the house centipede, are capable of inflicting a painful bite similar to a bee sting. Though the house centipede is usually 1 to 2 inches long, many other species of centipede can get as long as 6 inches or more. Have a worm-like body; long slender antennae protruding from head and 15 to 177 pairs of legs. Usually live outdoors in moist, protected areas such as mulch or piles of leaves, stones or wood. When indoors, prefer damp cellars, closets and bathrooms and may be found near baseboards, doorways and windows. 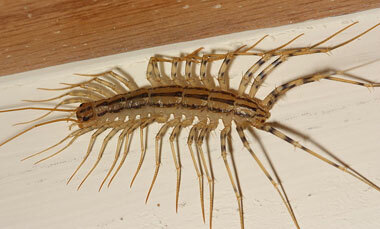 Centipedes are predators and feed on insects and spiders. They can move very rapidly. Contaminate food and surfaces through their feeding activity and urination. 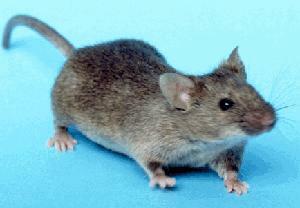 A protein in house mouse urine can cause asthma. House mice can also carry salmonella, lymphocytic choriomeningitis virus and a disease called rickettsialpox that is transmitted by the house mouse mite. 5 to 7 inches long, from nose to end of tail. Typically dusky gray, moderately large and distinct ears. Extremely common in cities and towns, prefer indoors. Throughout the United States. House mice are the number one rodent pest in most parts of the world. To prevent house mice from entering the home, remove food sources and seal exterior entry points larger than 1/4 inch. A house mouse can squeeze through an opening the size of a dime. In optimum conditions a female can produce 42-60 offspring in a year. Deliver a painful bite that draws blood; can defoliate trees and shrubs. Dull dark brown or rust brown; long legs, with spines on head and middle region of the body. Workers come in different sizes. Nest in sandy, well-drained soil, often on slopes with a southern or western exposure, and near water sources. Native to Central and South America, but some species live further north into Arizona, Texas and Louisiana. 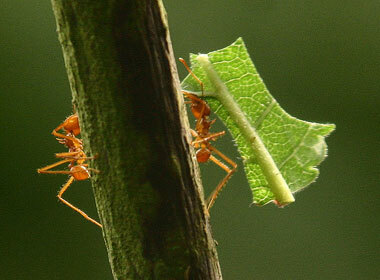 Leaf-cutting ants do not cut leaves to eat, but to use as compost for fungus gardens in their nests, on which they feed. They are efficient workers, and can defoliate an entire tree overnight. Some species transmit West Nile virus and other viruses that cause encephalitis (swelling of the brain), resulting in seasonal epidemics in North America occurring during summer and fall. Serious symptoms of West Nile disease can include high fever, headache, neck stiffness, muscle weakness, disorientation and paralysis. Mosquitoes also pose an important danger internationally where they carry and transmit the infectious agents that cause malaria, lymphatic filariasis, yellow fever and dengue fever. Approximately 1/8 to 3/8 inch long or the size of a small shirt button; two wings, body and legs covered with scales; long beak with piercing-sucking mouthparts. Can be found anywhere associated with water, including gutters, ponds, old tires or plant pots. There are more than 3,000 species found throughout the world, approximately 200 of which are found in North America. 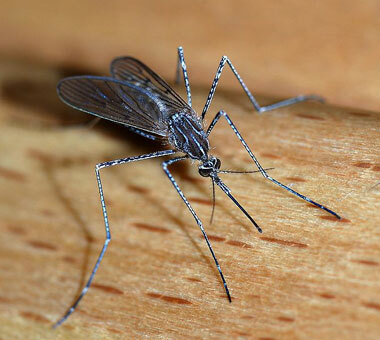 Reduce mosquito populations by removing standing water and thinning out vegetation from around the home. When outdoors, wear an EPA-approved insect repellent. Ensure that window screens fit tightly and securely, and keep doors and windows closed when possible. Known to bite; along with ground squirrels, prairie dogs, deer mice and other rodents, can carry plague. Norway rats can also carry murine typhus. These diseases can be transmitted to people by the fleas living and breeding on the rat. 13 to 17 inches from nose to end of tail; weighs 7 to 18 ounces. 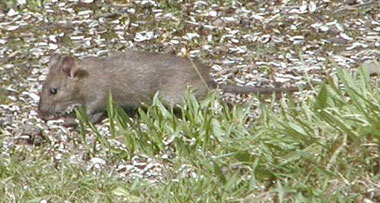 Stocky, heavy-bodied rat, typically grayish-brown. Nest around buildings or in underground burrows. To prevent entry into the home, remove food sources, eliminate attractive shelter areas and seal exterior entry points. The Norway rat originated in Central Asia, not in Norway. Their teeth can grow between 5 and 6 inches per year, so they constantly grind them against each other to keep them sharp and filed down. Inflict painful stings that can cause swelling, become infected easily and aggravate skin conditions or allergies. Some species aggressively defend their nest and will sting when disturbed. Others may be more docile. 5/8 to 3/4 inch long, varying in color from dark reddish-brown to orange with bright stripes in reds and yellows. Generally build nests that hang from horizontal surfaces, such as awnings, porches and decks, as well as in protected areas like gas grills or electrical outlet boxes. Are attracted to heat and light. Use light for direction, while heat warms their wing muscles to ease flying. Inflict painful stings and will sting repeatedly. Sting contains a toxic venom that can cause blistering pustules and severe anaphylaxis, or hypersensitivity. 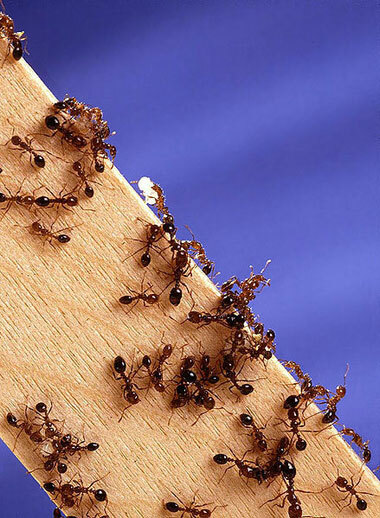 Serious fire ant attacks can produce thousands of stings and be deadly to humans and animals. Reddish-black in color, with fine hair mostly on head and abdomen. Workers come in different sizes. Sunny areas of fields, woodlands and open areas, in dry to moist soil. Southern United States from Florida to California. A mature queen can lay hundreds of eggs each day, and large colonies can have up to 250,000 workers. There are more fire ant mounds per acre in the United States than found in their native South America, because there are no natural predators found in the United States. Fire ants can readily enter structures and have been known to nest in electrical boxes, causing damage, and can girdle young trees, killing them. Can bite; along with ground squirrels, prairie dogs, deer mice and other rodents, can carry plague. Roof rats can also carry murine typhus. These diseases can be transmitted to people by the fleas living and breeding on the rat. 13 to 18 inches from nose to end of tail; weigh 5 to 9 ounces. 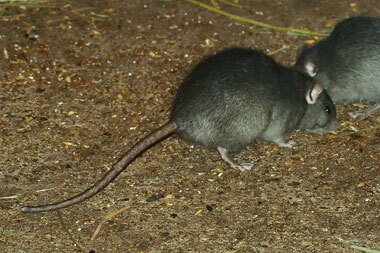 Medium-sized rat with tail longer than its body, slender body and large ears. Black or brownish black in color, with belly varying from grey to white. Exterior vegetation and inside buildings; often found in attics. Coastal states and southern third of the United States, Mexico and Central America. Very agile and can enter a structure through a hole the size of a quarter. The roof rat was the most common rodent found in southern European homes during the outbreaks of plague known as the Black Death in the 14th century. These tiny, miniscule flies inflict surprisingly painful bites and can spread leishmaniasis, a parasitic disease that causes skin sores, fever, weight loss and swollen glands. May damage internal organs. Breed in densely shaded, moist areas such as salt marshes, mud, plant debris, freshwater areas and damp-rot holes of trees. Throughout the United States but concentrated along coastal areas and waterways. May also be found in outdoor settings such as campgrounds, wooded areas and golf courses. Although not typically an indoor problem, sand flies are able to enter buildings through typical insect screening because of their tiny size. Very fine mesh netting (at least 18 holes to the inch) is needed to create an effective barrier against sand flies. Inflict painful stings that can be fatal to those with allergies, and, with certain scorpion species, to small children and the elderly. Some species can be as big as 2 to 4 inches long, or about the length of a standard business card; have large pincers and long, curled tails tipped with stingers. Prefer dark, protected areas – often in and around structures – in warm regions. They are able to enter homes in many areas. Throughout the southern United States, from coast to coast, Mexico and Central America. All scorpions glow under black light, making black light an effective way to inspect for scorpions at night or in dark areas. 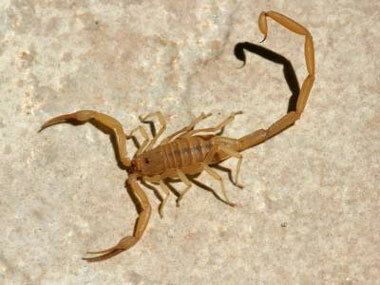 Scorpions have live births and carry babies on their backs. Hairs and spines, when broken off, release poisons that cause a painful burning sensation and inflammation, much like a bee sting. 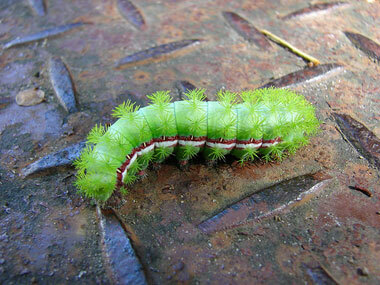 Up to 2 1/2 inches long; light green, with narrow reddish lines bordered by a white line running along each side; covered with green stinging spines. Open woods and meadows, and sometimes cornfields. Eastern North America, as far west as eastern Utah. In addition to the Io moth caterpillar, there are a handful of other caterpillar species that possess poisonous spines or hairs for protection, including the buck moth, puss caterpillar and saddleback caterpillar. In some parts of the world, deliver a painful bite and venom that can kill. In North America, bites are mildly painful, similar to a bee sting. In the United States, some tarantula species can have a leg span of up to more than 5 inches or the diameter of a CD-ROM; vary in color and are very hairy. Tarantulas are the largest spiders in the United States. Burrows in the soil and under stones and logs. Southwestern United States, particularly in New Mexico, Arizona and Southern California; midwestern states and Louisiana. Also found in Mexico and Central America. All tarantulas have extremely poor eyesight and detect prey by vibrations from the prey’s movement. 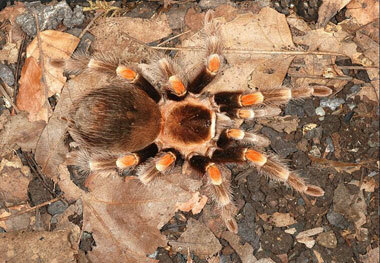 When agitated, tarantulas shed their hair. The hairs can feel like peach fuzz and can cause stinging or irritation. 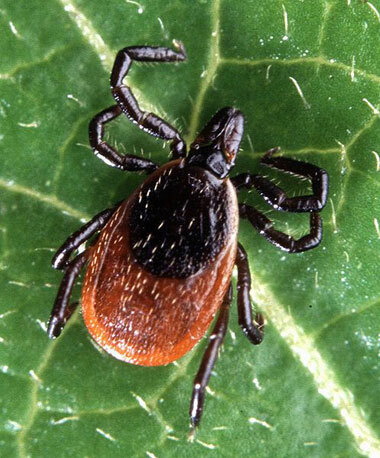 Can carry and transmit diseases including Lyme disease, Colorado tick fever, Rocky Mountain spotted fever, babesiosis, relapsing fever and tularemia. Lyme disease is the most common vector-borne disease in the United States. In the United States, ticks cause more illnesses each year than mosquito-borne diseases. Adults have eight legs and are 1/8 to 5/8 inch long; smaller than a sunflower seed; color varies by species. Nymphal (immature) ticks are even smaller, less than 2 millimeters. Common problem ticks include the following: American dog tick, deer or black legged tick and lone star tick. In or near areas where they can hide in vegetation, including woodlands, fields and areas with shrubbery and tall grass, and drop onto animals that pass. Always check your body and pets for ticks promptly after spending time outdoors in wooded or grassy areas. People can reduce the number of ticks near their home by clearing some shrubbery and grasses and working with pest management professionals. Adults can live approximately three years without a meal. Inflict painful stings that can cause swelling, become infected easily and aggravate skin conditions or allergies. Defend their nests when disturbed and can release an attack pheromone (chemical signal) to other nest mates, launching an aggressive attack on victims. Approximately 3/8 to 5/8 inch long or about the size of a piece of candy corn; have black and yellow stripes, white and black stripes or red and black stripes, depending on species. Usually nest in the ground, in areas such as abandoned rodent burrows or similar holes, but can also nest in trees, walls, attics or structural voids of homes. 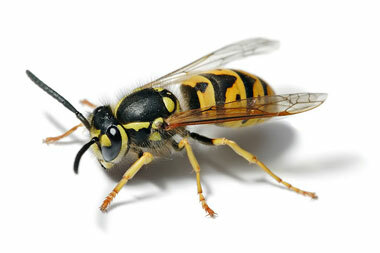 Account for more than 70 percent of flying insect stings in most areas.